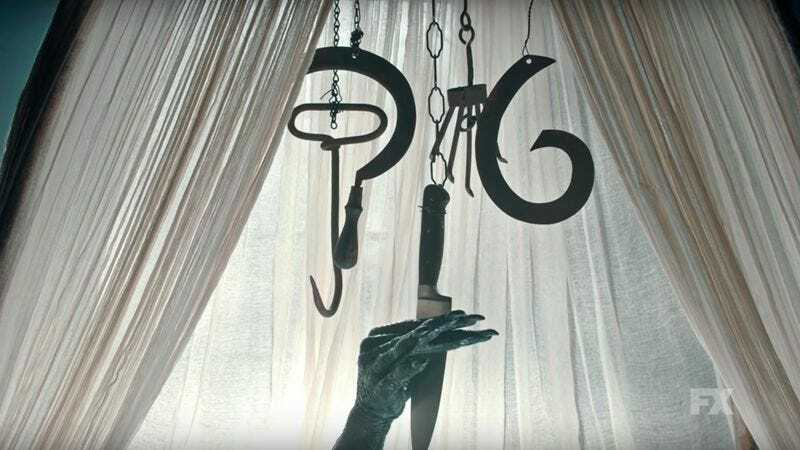 American Horror Story is returning to FX on September 14, and for now, the network and creators are being coy about the plot. They have, however, released a series of six teasers that hint at the slew of horror tropes they plan to juggle with clumsy enthusiasm in season six. According to Variety, series creator Ryan Murphy has previously said all the seasons of AHS are related to each other; whether that means they take place in the same universe is both unclear and exhausting to think about. Meanwhile, John Landgraf, the president of FX Networks, has stated only that season six will take place in two separate time periods. Stars Lady Gaga, Denis O’Hare, Cheyenne Jackson, Angela Bassett, Evan Peters, and Matt Bomer will all be returning as well. Beyond that and the following teaser spots, little is known about what kind of grotesque, extravagant, fisheye lens-sporting, torture-scene-cramming, Lady Gaga-having contents will unfold. A farmhouse. A chainsaw. Distant screams. Sure, this one evokes The Texas Chainsaw Massacre, but it also has Courage The Cowardly Dog written all over it. Creepy farm family. Glowing eyes. Here’s hoping for a character named Malachai. Lest we forget, this is American Horror Story, so let’s watch someone staple a guy’s head closed. Fine, sure, a demon baby. Wait, maybe these evil farmers have lots of demon babies and make them live under the stairs? The childlike humming heard in some of the other spots is louder in this last installment. But not quite loud enough to drown out the sound of far too many millipede legs skittering down a girl’s face. Does she live under the stairs? Is that why she seems indifferent to the millipede? Intriguing.